Hello and welcome to the Seddonville Hotel. Here we are half way between Westport and Karamea in the heart of New Zealand’s West Coast, amid untouched natural scenery and away from the stress of city life. We look forward to meeting you and sharing our little corner of paradise with you. Graeme was born and bred in North Canterbury but visited the West Coast in his youth and fell in love with the place, returning every chance he got. It has been his dream since to eventually live here and after running the Waipara Hotel for 4 years, had the opportunity in 2003 to purchase the Seddonville Hotel. His dream has come true. After a visit by Premier Richard John Seddon in 1903, a fledgling coal settlement on the south bank of the Mokihinui River was named Seddonville. Situated in the central valley and surrounded by majestic mountain ramparts and bush covered hills, this historic township is a mere 30 minutes scenic drive north of Westport – halfway to Karamea. Just 5 minutes from the hotel taking you over little walking bridges and through the old 50 metre-long railway tunnel where at night the glow worms make a spectacular display. It is a beautiful walkway to do during the day and see the moss covered rock walls, views of the river, and the beach where the “LOST WORLD” was filmed. To really appreciate this beautiful walkway allow a day. Start from the old Charming Creek coal mine (now closed) on a gentle gradient down to Ngakawau. The rail line was put in to take coal and timber out of the area. 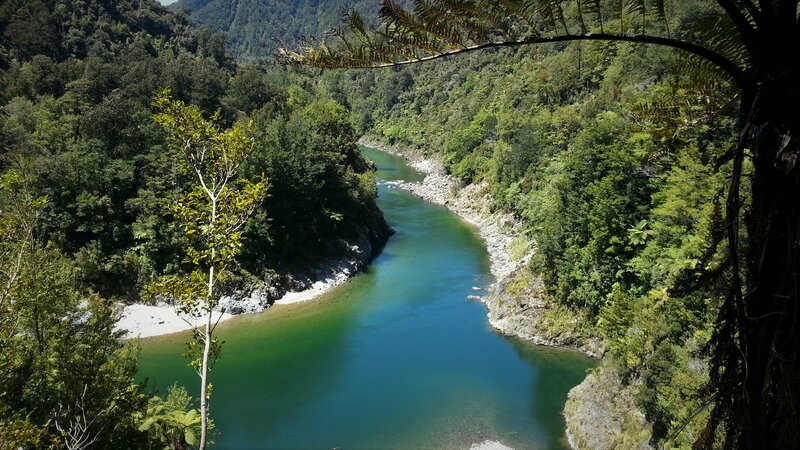 It meanders over bridges, through tunnels, around old workings and machinery, with amazing views of the Ngakawau Gorge flora and fauna and the stunning Mangatini Falls. A wilderness experience. Ride or walk amongst magnificent native forests, river gorges, valleys and old gold mining towns. We recognise that the logistics of getting to some of our amazing destinations can sometimes be a challenge, check out the Old Ghost Road website for information on local trail operators. Until 1929 it was the main road to Karamea.It was the bustling site of five gold mines, the Red Queen being the best known. The road takes you through one ford to Welcome Bay from there the track takes you past the Iron Bridge and the Rough and Tumble – 3hrs, then inland up the dramatic and scenic Mokihinui valley to the Forks a DOC hut -8hrs trek. You can even catch whitebait in season at the Mokihinui River mouth. with its impressive peaks overlooks Seddonville, sometimes snow capped in winter. This alpine tramp with magnificent views of the limestone landscape of Kahaurangi National Park and the coast coal plateau makes you feel on top of the world. Take your camera.